In 2001 an initiative was started by the Swiss Corporation (New7Wonders) Foundation to choose the Seven Wonders of the World (New7Wonders) from a selection of 200 existing monuments. Twenty-one finalists were announced January 1, 2006. The following satellite images are made possible by cutting edge satellite imaging technology. Petra, Jordan meaning “Rock” in Greek is an archaeological site in Jordan, lying in a basin among the mountains which form the eastern flank of Arabah (Wadi Araba), the large valley running from the Dead Sea to the Gulf of Aqaba. It is famous for having many stone structures carved into the rock. The long-hidden site was revealed to the Western world by the Swiss explorer Johann Ludwig Burckhardt in 1812. The city was the principal city of ancient Nabataea and was famous above all for two things: its trade and its hydraulic engineering systems. It was locally autonomous until the reign of Trajan, but it flourished under Roman rule. © DigitalGlobe and Courtesy of Satellite Imaging Corporation. One of the most famous Incan cities in the world, sun alignments are found throughout Machu Picchu. Many features, including the Sacred Plaza, The Temple of Three Windows and The Intihuatana platform, align with the summer solstice azimuth of 65-245 degrees. Scientists believe these alignments were primary considerations in the construction of the shrines. A shaft of light, shining through an east-facing window, reportedly illuminates The Torreon, or Temple of the Sun, during the summer solstice. The city was built between 1460 and 1470 AD at an altitude of 8,000 feet. © DigitalGlobe and Courtesy of Satellite Imaging Corporation. Christ the Redeemer, a statue of Jesus Christ in Rio de Janeiro, Brazil. The statue stands 38 m (105 feet) tall, weighs 700 tons and is located at the peak of the 700-m (2296-foot) Corcovado mountain in the Tijuca Forest National Park at WGS84 Latitude: 22°57’5″S and Longitude: 43°12’39″W, overlooking the city. As well as being a potent symbol of the Roman Catholic Church, the statue has become an icon of Rio and Brazil. © DigitalGlobe and Courtesy of Satellite Imaging Corporation. Copyright © NASA/Japanese Space Team and Courtesy of Satellite Imaging Corporation. All rights reserved. The Great Wall started as earth works thrown up for protection by different States. The individual sections weren’t connected until the Qin dynasty (221-206 B.C.). It was during the Ming dynasty (1368-1644) that the Wall took on its present form. The brick and granite work was enlarged and sophisticated designs were added. The Ming Emperors, having overthrown the Hun dominance and expelled their Mongol rulers of the North devoted large portions of available material and manpower to making sure that they didn’t return. The Great Wall is the world’s longest human-made structure, stretching over approximately 6,400 km from Shanhai Pass in the east to Lop Nur in the west, along an arc that roughly delineates the southern edge of Inner Mongolia. It is also the largest human-made structure ever built in terms of surface area and mass. Satellite Image: NASA/Japanese Space Team. In a spectacular show of shadow and light, a shadow representing the Feathered Serpent god Kukulkan slides down the northern stairway of Chichen Itza during sunset of the equinoxes and then vanishes. The square, stepped pyramid, built by Mayans in about 1000 to 1200 AD also has axes that orient with the rising point of the sun at the summer solstice and setting point during the winter solstice. Many think the pyramid also serves as a calendar. Each of the four faces of the pyramid has a stairway with 91 steps. With the addition of a shared step forming a platform at the top, this totals 365, the number of days in a year. The stairways also divide the nine terraces on each side into 18 segments, representing the 18 months of the Mayan calendar. © DigitalGlobe and Courtesy of Satellite Imaging Corporation. Located at the city of Agra in the State of Uttar Pradesh, the Taj Mahal is one of the most beautiful masterpieces of architecture in the world a style that combines elements of Persian, Turkish, Indian, and Islamic architectural styles. While the white domed marble mausoleum is the most familiar part of the monument, the Taj Mahal is actually an integrated complex of structures. Taj Mahal was built by the Mughal emperor Shah Jahan in memory of his favorite wife. © DigitalGlobe and Courtesy of Satellite Imaging Corporation. The Colosseum/Coliseum, Rome, Italy was built from 72-80 A.D., the large, elliptical arena seats 50,000 spectators and represents one of the ancient Rome’s greatest architectural achievements. 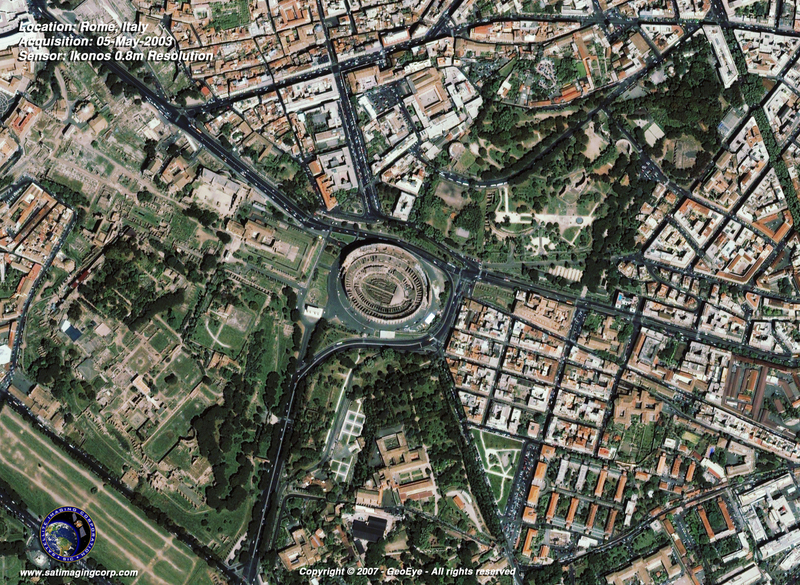 Completed in 81 AD, it is called the Coloseum after a colossal statue of Nero that once stood nearby. It was used for staged battles, sometimes between lions and Christians and other heretics, among other spectacles, and is one of the most famous pieces of architecture in the world. The structure covers about 6 acres (188m by 156m or 615 ft by 510 ft) and stands 48.5 m (158 ft) tall or about 15 stories and took ten years to build. Two of the remaining entrances were used by Emperor Titus and two for the gladiators. © DigitalGlobe and Courtesy of Satellite Imaging Corporation. Posted on 12/16/2012 by visionsofearth. This entry was posted in Ancient Sites, Manmade Structures, Popular Destinations, Seven Wonders of the World, World Heritage Sites and tagged chichen itza, christ the redeemer, colosseum, great wall of china, ikonos, jordan, machu picchu, new7wonders, petra, quickbird, satellite imagery, satellite images, satellite photos, seven wonders, seven wonders of the world, taj mahal. Bookmark the permalink.